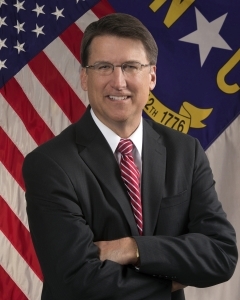 As the North Carolina General Assembly hurtles forward with its stunning power play to seize numerous duties that Gov.-elect Cooper is scheduled to assume January 1, it’s increasingly clear that there’s only probably one person left who can conceivably do anything to stop it. That would be the current inhabitant of the Governor’s mansion, one Patrick Lloyd McCrory. With just three weeks left in his term as Governor, the one-time moderate mayor of Charlotte has one last opportunity to do what’s right by standing up for the prerogatives of the office he has inhabited for the past 47 months and vetoing any such bills the General Assembly sends his way. By doing so and fighting like heck to sustain the veto(es), McCrory could defend the office of the Governor, prevent a great injustice and take a stand against his tormentors/abusers down the street who have treated him like an errand boy for so long. McCrory was so serious about his position that he actually enlisted former Governors Jim Hunt and Jim Martin to join him in a lawsuit against the General Assembly — a lawsuit in which he ultimately prevailed. If the Guv wants that previous effort to have really meant anything, he needs to get Martin and Hunt (and Cooper too) to stand by him again as he vetoes the nonsense being cooked up in the General Assembly this week. Unfortunately, thus far, McCrory has been embarrassingly silent and, by all indications, as impotent as ever as lawmakers have unpacked, polished and wielded their statutory wrecking ball. The bottom line: Let’s hope McCrory gets off his duff and takes a stab at doing the right thing in this, his last big chance. If he does go along with the legislative scheme by affirmatively assenting or just pretending to ignore the whole mess, it will be a sadly fitting conclusion to a truly desultory governorship. Wealthy Plutocrats have bought, not so bright, unethical agents to fill the NC Legislature and Governor’s office. Art Pope and Duke Energy are determined to block all peaceful avenues of political change in NC. Gerrymandering, voter suppression, corporate money in politics, and propaganda feeds from Civitas Institute (Art Pope’s political voice) to local media are not enough, now all out Fascism is their agenda. The NCGOP’s move to strip NC citizens’ choice for Governor, Mr. Cooper of political power is wrong on so many levels but don’t expect Pope’s puppets to be bright enough or ethical enough to recognize their crime. Doing the right thing in the GA is a thing of the past. Doing the “right thing” in the GA is sadly a thing of the past. Governor McCrory, Please take an ethical stand for both your earlier stated beliefs concerning the need to maintain the power of the position of the Governor and for the respect of the voters who chose Mr. Cooper. You have one last chance to show that you are a man of character.